The shell of Hyriopsis cumingii (Lea), Cristaria plicata ( Leach) of family Unionidae or the shell of Pteria martensii (Dunker) of family Pteriidae. The unionidae is from rivers and lakes in China, and the Pteria martensii is from the coast area of Guangdong, Guangxi and Hainan provinces in China. Collected during the whole year. Light fish smell, light taste. Large, white, porous and without pieces. 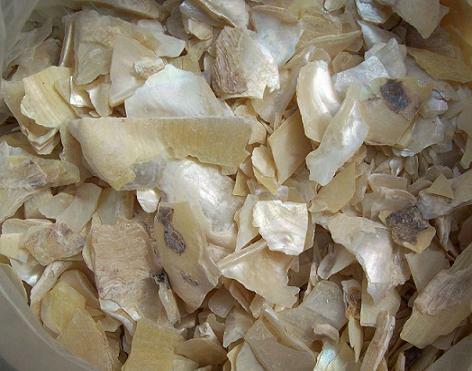 Flesh removed, washed, black outer layer scraped off, dried in the sun; unprocessed or calcined; smashed. Salty, cold; liver and heart meridians entered. 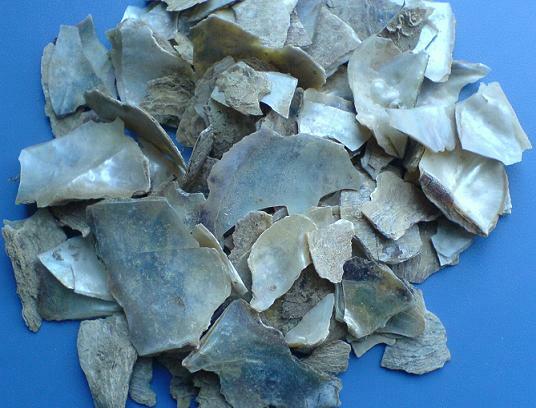 Pacify liver and subdue yang, clear liver heat and improve vision, suppress heart and induce tranquilization. It is similar to Shi Jue Ming in pacifying liver, subduing yang and clearing liver heat, but its action is weaker than that of Shi Jue Ming. It is good at calming heart and inducing tranquilization to enter heart meridian. So it is mutually reinforced by Shi Jue Ming. For liver yang hyperactivity due to liver-kidney yin deficiency with such symptoms as dizziness and dizzy vision, it is usually combined with liver-yang-pacifying herbs, such as Bai Shao, Mu Li and Ci Shi, etc. For liver yang hyperactivity and up-flaming of liver fire with such symptoms as restlessness and irritability, it is often combined with liver-heat-clearing herbs and fire-purging herbs, such as Xia Ku Cao, Gou Teng and Ju Hua, etc. With actions of clearing liver fire and nourishing liver yin, it is the key herb to treat eyes disease. For blood-shot eyes and nebula, due to liver heat, it is often combined with liver-clearing, vision-improving and nebula-removing herbs, such as Shi Jue Ming, Ju Hua and Xia Ku Cao and so on. For dim vision, blurred vision due to liver deficiency, it is often combined with liver-nourishing and vision-improving herbs, such as Gou Qi Zi, Nv Zhen Zi and Hei Zhi Ma and so on. It has actions of clearing liver and heart fire, inducing sedation and tranquilization with heart and liver meridians entered. For restlessness of heart-mind, palpitation, insomnia, it is often combined with sedation-inducing and tranquilization herbs, such as Zhu Sha, Long Gu and Hu Po and so on. For restlessness of heart-mind with up-flaming of heart fire, it is combined with Huang Lian and Zhi Zi to reinforce the action of clearing heart fire. In addition, it is smashed into fine powder and externally indicated for sores, pruritus and for its action of drying dampness and healing wounds. Decoct 15~30 g. It should be smashed and decocted first. Take powder or pills l~3 g. Take proper dose for external application.